I'm so happy to be part of the blog tour for the new novel by Heidi Swain; Sunshine and Sweet Peas in Nightingale Square which release on 31st May. I'm sharing my review with you today but be sure to check out the other stops on the tour for exclusive content and other fabulous things. 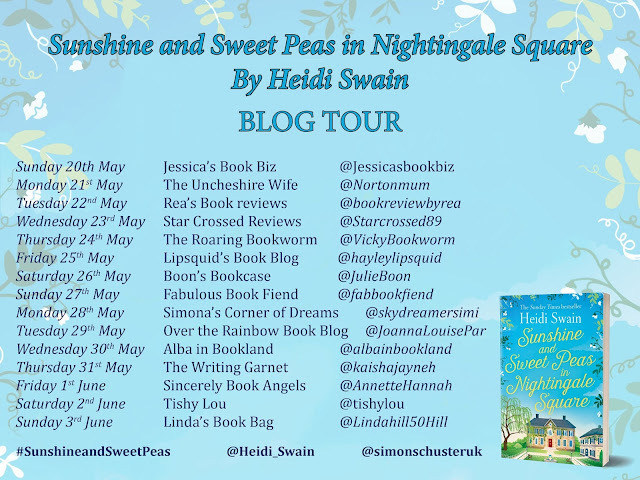 Also make sure you're following the hashtag and social media links on the tour banner so you don't miss any Sunshine and Sweet Peas news! Review: With a Heidi Swain novel, you always know you are going to get a great cast of characters, a fabulously English setting and the very dramatic ups and downs, comings and goings that can occur in a small town community. And this novel is no exception. Fan of Wynnbridge will be pleased to know that, whilst this novel is not set in our favourite market town, Kate, our main character is originally from there and is the sister in law of Jemma from the Cherry Tree cafe-hurrah! 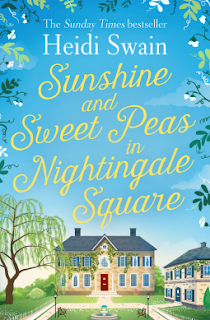 I loved this new setting for Heidi's novels because it meant that we got to meet a whole new set of characters, and because this is a small community, despite being part of a larger city, they all come and go from each others houses and obviously spend a great deal of time socialising in Nightingale Square. So if you are a fan of gossip and salacious stories, this is definitely going to keep you entertained from start to finish! Kate is a great character to get to know and I really hope we get to hear more from her in the future. She is someone who is being forced to start again and she knows exactly how her life is going to look. We have all fallen into this trap of thinking our lives have to start and end a certain way and we all know that Kate is in for a bit of a shock if she thinks everything is going to go the way she planned. Kate is also someone who has quite a few struggles in her life, from her personal and professional life, to her family life and her own self-esteem. I loved her flaws and I loved watching the journey she went on over the course of this novel. As I mentioned there are a whole host of other characters in the square. I sometimes had a little trouble keeping track of who was who, but that is really my only issue I had with this novel. One of the things that these characters brings to light is the importance of not just community, but of female friendship as well. There are some strong women in this community but they are even stronger when they support each other and back each other up. I loved that particular strand of the storyline. Of course there is some romance in this novel, it wouldn't be a Heidi Swain novel if there wasn't and Heidi really does keep us all on our toes right the way to the end, so if you're looking for insta-love, you're in the wrong place. But if you're a fan of the slow burn, aren't we all, then you're going to love some of the romantic aspects of this book. This really is a great book to have lined up for a sunny day in the garden, or more realistically a rainy day inside looking out at the plants growing. 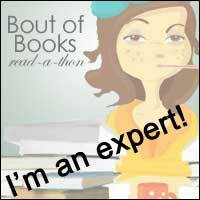 Its a great read and whether this is your first Heidi Swain novel or not, you're in for a treat!